This article is bound to be the end of me. I have been skirting around it for years. Always too afraid to commit, trying to find and angle that didn't exist. Perhaps I have been afraid of expulsion by my peers, forced into exile because of this, all too simple but oh so multi-pronged conversation. The first thing that I have to tell you is that there is no winner in this tale. Neither one way is a 'better way' of constructing a surfboard, so if you are looking for a definitive answer then look elsewhere. If you are however, interested in the facts of the matter and some opinions of shapers and surfers from all over the world, then I invite and coax you onward. Firstly - The Eco Conversation. 1- Shipping : By far, the biggest pollutant in surfboard manufacturing is shipping. That's right, it's not about the foam, the resin or the glass but instead about how far away from the consumer that board is made and therefore how far it has to travel. The Eco impact of this shipping dwarfs any harm that can be done during the manufacturing process. For this very true and relevant fact you may think that your choices are now limited to your local shaper, well it's not that easy as some shapers will order blanks from different continents which obviously have to be shipped. Two of the most respected blank blowers are SA Blanks in South Africa and Burford Blanks in Australia. I personally know some shapers that order these blanks both in the USA and Europe because they want to work with the best materials, and who can blame them. After emailing them to find out more about this promising construction we where told that it was better because it was. Go figuire. Interestingly this little publicized fact actually makes Firewire surfboards, that are manufactured in Asia, suddenly the most dangerous to our planet.. If you want to have the conscience of a free-range cucumber eating, cave-dweller then ask your local shaper where he sources his raw ingredients and don't buy foreign surfboards. 2- The Blank : The next biggest impact on the world of trees and oceans is the 'blowing' of the blank from two standpoints, that of the release of CO2 into our atmosphere and the toxicity of the substances. An EPS (Expanded Polystyrene) blank will produce 2.8kg of CO2 per kg of foam during manufacturing, in comparison a PU (Polyurethane) blank will release 3.6kg so a small (and I do mean small) plus for the EPS blank there. The toxicity level of the process of making the various cores is very different. EPS or PS cores incorporate a chemical called Meythylene Diphenyl Diisocyanate, or MDI to its mates. This compound is about 3000 times less toxic to humans than the known carcinogen, Toluene diisocyanate, or TDI for short, which is used in the production of PU surf boards. It seems clear then the PS or EPS is far safer to produce. Let's keep things in perspective though, we are talking about the impact on the planet. 3- Resins: These we refer to as skin plastics. The resin hardener MEKP which is used in polyester resin is about 10 times as lethal is that used with epoxy resin. Again to keep things in perspective here our old mates TDI or MDI (from the blank blowing) are about ten thousand times more toxic than MEKP found in the resin hardner. Are these SD designs made by Firewire really that eco-friendly. So epoxy seems safer right? Well let's throw in this. Some people can become what is referred to as 'sensitized' to epoxy. This only happens to some people, and does not occur with polyester resins. What happens is that a person becomes allergic to the chemical, which manifests in severe irritation of the skin and eyes. There are no hard and fast rules about who will be effected, some people are effected with minimal expose and some never develop a reaction. Nice try Rob but these come from a long way away therefore being one of the worst offenders eco-wise. 4- Glass: This is generally thought of as having the lowest impact of the environment of the aforementioned points but let's look at the alternatives. E-Glass and S-Glass make up over 98% of all surfboards on the market at the moment. The other 2% made up of natural fibers such as hemp, bamboo or wood. Great, but while the 'sustainable' side of both hemp and bamboo 'out trumps' that of regular E- or S-Glass, the fact is that the processing of these two materials into a woven mat are far more energy intensive. Lets finish this Eco section by agreeing that if you do want to eat organic cucumbers that are farmed by chickens who own their own land and will receive a final salary pension then the best thing to make a surfboard out of is wood. Both Balsa and Paulowina wood, that you can grow yourself, are the highest recommended woods for board building, so get out there and start planting. On the flipside of the coin if you just want to surf and don't care about the planet or our continued existence upon it then maybe Firewire might be a better bet. 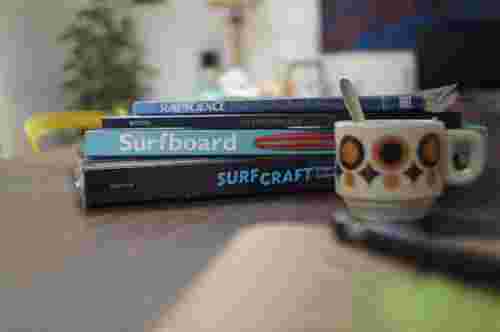 Thanks for the read, this has been the first article in many more planned to cover the huge topic of surfboard construction and design. In later articles we will talk about the merits and drawbacks of all of the different construction techniques, different features, hull designs, tails, rockers etc. If this is something that you would like to know more about then drop us a line at Surf Bunker or leave a comment. Time to research the facts, then check them. Twice. Doing some homework and some fact checking.